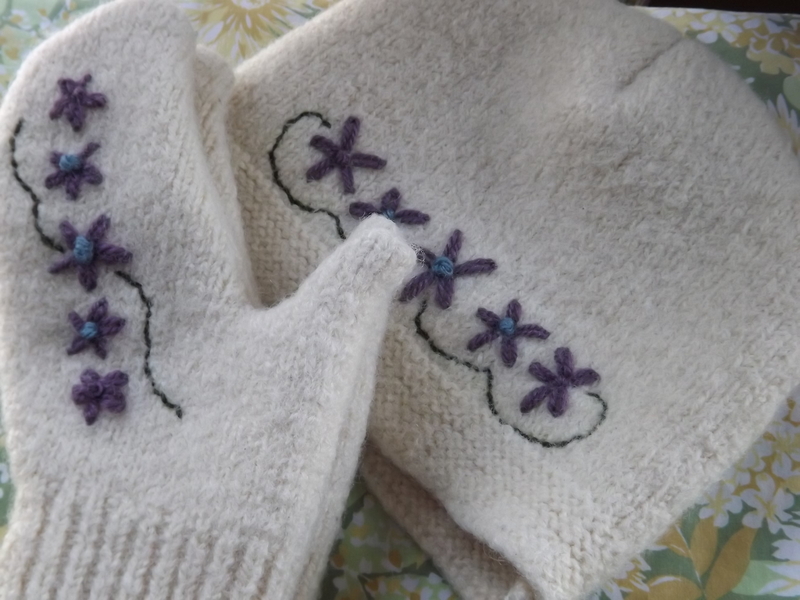 A while back, someone shared with me this post about creating mittens from old sweaters, and immediately, my friend Sigrid mentioned this sweater. 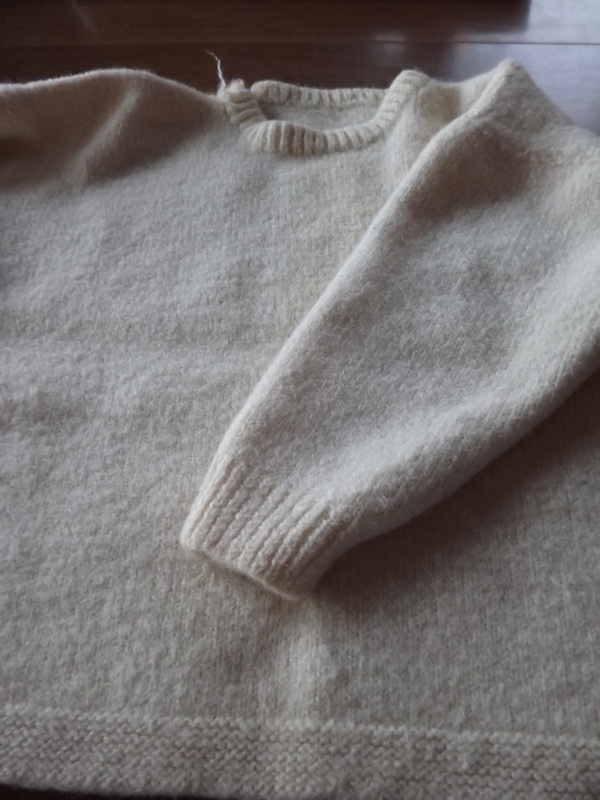 Many, many moons ago, when she first learned to knit, she painstakingly created this creamy wool tunic. She loved it so much, she said, because it was completely her style, and totally the right length and loose slouchy fit, with interesting details on the hem and cuffs. Somewhere along the line, the sweater shrank. But Sigrid just couldn’t get rid of it. 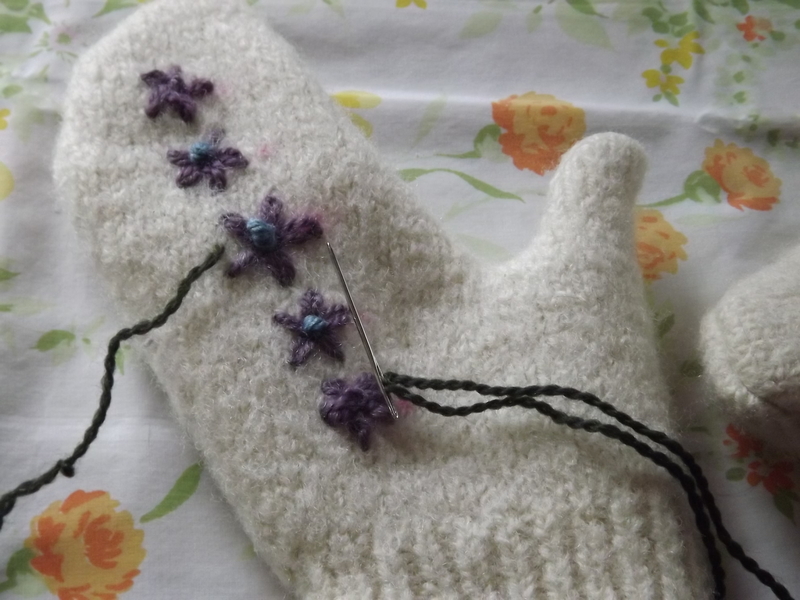 And when she saw the mitten idea, she envisioned a new life for her old sweater. I was scared to try. I’d never done this before, and this sweater clearly held meaning for Sig. What if I cut it and couldn’t make it work? Not only was she game to try, but she thought perhaps I could make a hat too? 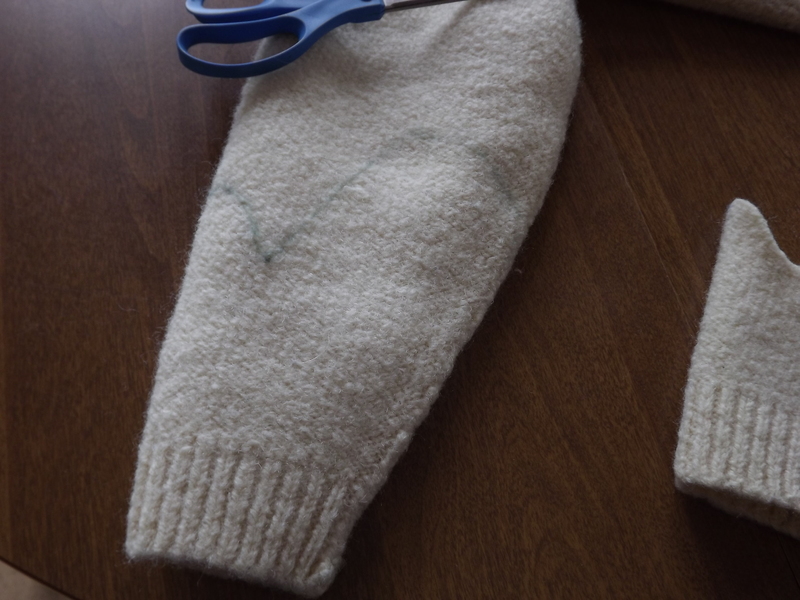 I could see how I’d have enough surface, until she suggested I cut the mittens from the sleeves. Brilliant! I watched the above video a couple times, then turned it off and started my own project. 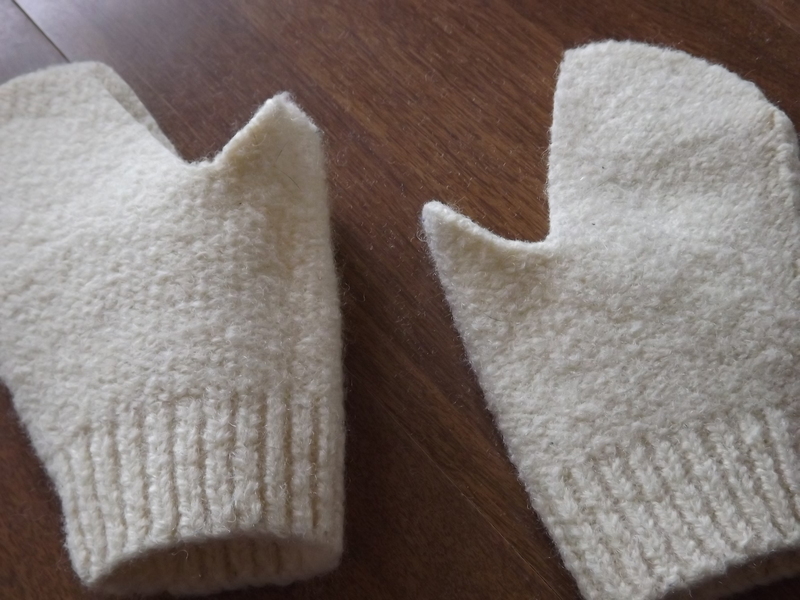 First, I cut the mittens from the sleeves, and stitched them together. I wasn’t completely thrilled with how they turned out, but encouraged enough to press on. 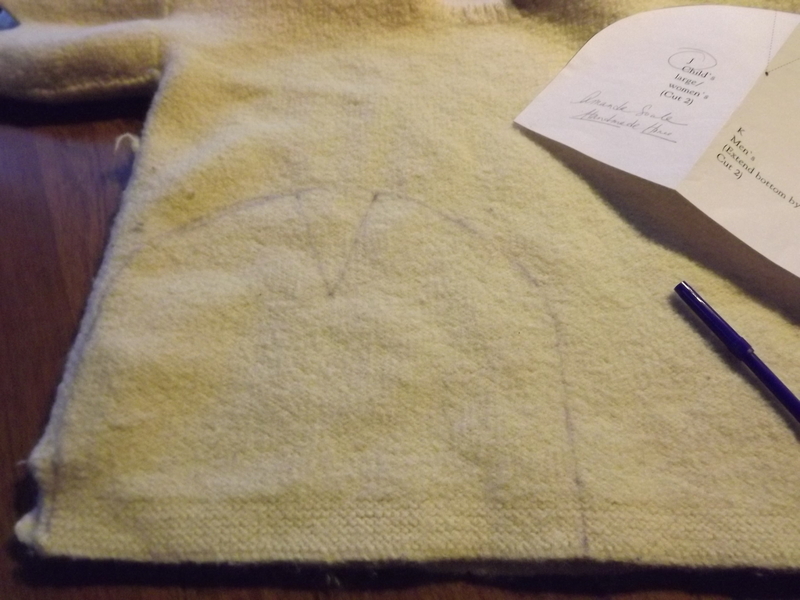 Next, I used Soulemama‘s Family Sweater Hat pattern from her book Handmade Home, to trace and cut a hat. Having used this pattern before with too small results, I sized up (which might have been a mistake, as I ended up restitching and cutting down several times to get something resembling the proper size). Once everything was stitched, I was happy enough with my efforts, but it looked a bit bland. 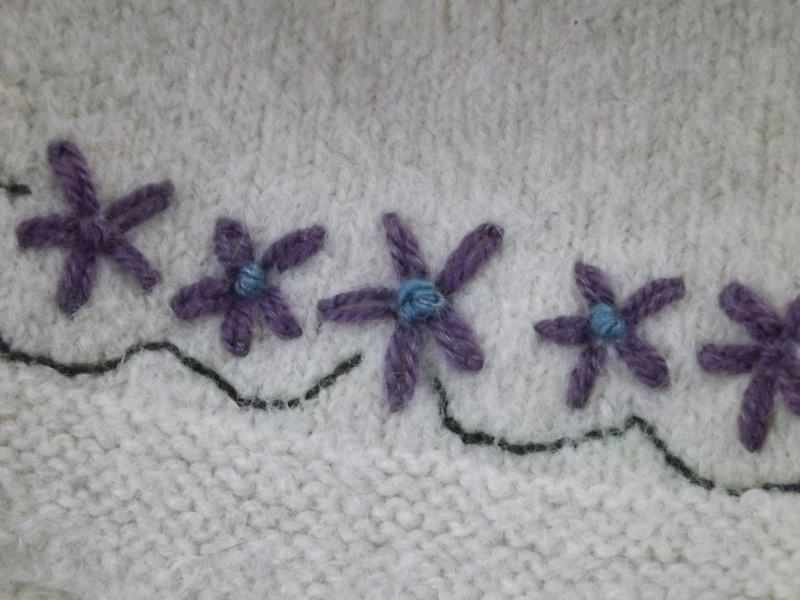 Though I haven’t done much needlework at all in close to a decade now, I sat down and began to create a design, freehand, with the bits and bobs of yarn I’ve got kicking around here. This is what I ended up with. Thanks, Nicole! I enjoyed playing with them. Lots of ideas for what I’d do differently the next time…..